Scott Dorsey: If you want to create radical enterprise value for a BigCo, you should be looking at startups and you should be looking at startups that are disrupted. Dave Knox: I’m your host, Dave Knox, and this is Predicting the Turn. 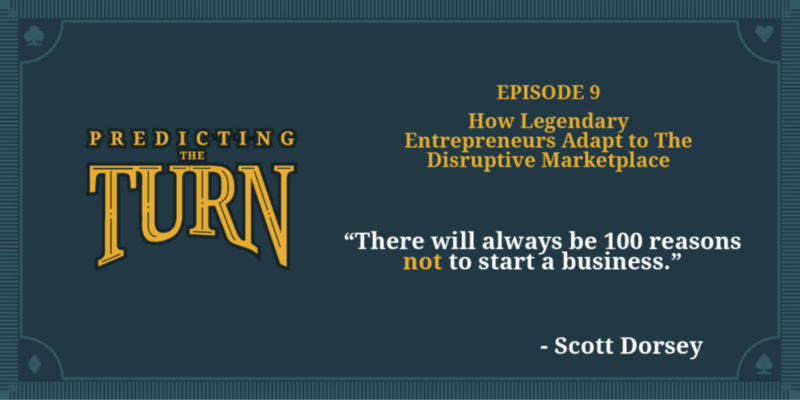 A show that helps business leaders meet their industries inevitable disruption head on. Welcome to another edition of Predicting the Turn. Today I have a chance to sit down with one of, I think, the Midwest’s greatest entrepreneurs, best investors and really somebody that has changed this community for the better. Joining me is Scott Dorsey, who most famously is the founder and former CEO if Exact Target and now is one of the cofounders of High Alpha. So, welcome Scott. Scott Dorsey: Hi Dave. Thank you, great to be on the podcast and thanks for the warm intro. Dave Knox: Well, thank you. I want to dive in and start right with ExactTarget the company that you spend nearly 14 years at as the co-founder and CEO. ExactTarget is arguably the most successful story of building a Midwest based startup and tech startup in particular. You started in 2000. You took it public in 2012 and then you sold it to Salesforce in 2013 for an amazing sum of over 2.5 billion that kept growing as Salesforce kept going, which was good. Along the way you pioneered this whole concept of the marketing cloud and beyond your core offering of email marketing, you acquired CoTweet and iGoDigital and Pardot. That’s a ton going into that, when did you realize that ExactTarget had a chance to go from the company that was your initial spark to this massive billion dollar company that was going to pioneer the marketing cloud? Scott Dorsey: We were so fortunate. We the entrepreneurial journey of a lifetime, starting out as three first time entrepreneurs, first time software entrepreneurs and ultimate building a meaningful company. Our founding principle was about helping marketers leverage data to send more targeted and personalized communication to their customers and that really came from my cofounder Chris Baggott growing up in the world of database marketing at R.R. Donnelley and the expression of those communications were print and catalogs but the concepts of database marketing were really solid. So that’s where we started and we were fortunate to catch the wave of digital marketing and catch the wave of software as a service. I would say where we started to realize we were more than email was really around our data strategy. So we, early on, as a I mentioned, we were founded on this database principle and we wanted to integrate everywhere and anywhere we could on behalf of our customers to bring data into our platform so we were ironically early in integrating with Salesforce, even before the average change existed, is one example. So we wanted to integrate with ecommerce systems and point of sale and CRM and really start to be the database of record for the marketer. And when that started really happening, really happening, then it became apparent that we were more than just a single channel company. That we really had an opportunity to be omni channel and start providing technology across all forms of digital communication. It was also interesting, Dave, from investors and then public investors, I felt like I was defending email at every turn and there’s still narrative today about the future of email and while other channels can blaze email, it was a better position for us with customers and investors we’re channel agnostic. We’re expert in email, but we’re going to go wherever marketers can best reach and communicate with their customers and that was some of the early thinking and development into that broader strategy. Dave Knox: I love that. And every entrepreneur, even a big company, when they’re thinking about the future of where they’re going to go, they have to make that choice, do we partner, do we buy, do we build it ourselves and for part of it, you made the decision to buy, like I said with CoTweet and Pardot and others. What drove you to say I’m going to go find that company, buy it, versus build it myself? Scott Dorsey: Sure, that was a fun part of our growth strategy. We completed six acquisitions, three that were product expansion and three that were geo-expansion. Scott McKorkle, who you know who led R&D in technology development for us, always felt like we could everything. We could build anything and everything and we had a huge passion for R&D and it was actually very important to us as we grew in scale as a company that we continued to invest 20% into research and development. So, we kept that level of investment all the way through the history, all the way through the scaling of our company. Where we started to see opportunity for M&A were really areas in which we didn’t have expertise and areas where we thought we could bring technology in that we just hadn’t been able to prioritize, perhaps, or we just didn’t have that expertise. To your point, the first one ever was CoTweet. So we acquired CoTweet and that put us in a first mover position of combining email and social together. Social was just coming of age, so it was an innovative move and did two things for us. One is it repositioned the company as more than email, and that was really important. And then two, it gave us a presence in San Francisco that was important. Being in Indianapolis was home base and always home base, but it was important that we started to branch out around the U.S. and globally and there’s so much tech and development talent in San Francisco it gave us the beach head that we could build from. The other acquisitions were really something special. Our geo-expansion acquisitions were resellers. So, when we were thinly capitalized and scrappy our best path of international expansion was to work with resellers that agreed to sell our product and represent us in market and it was a much lower cost and lower risk way of us entering markets like the UK, Australia, and even Brazil and what happened in all cases is that these resellers were doing so well. They became a part of our family. They build the customer base with us and it became really logical then to acquire them once they started to scale. So three successive years we acquired a firm in London, then we acquired a firm in Melbourne and then one in Sao Paolo, Brazil and that really built out or global presence and then our last two acquisitions were done in the same day October of 2012 we announced, it was really fun actually to see Spotify announce two acquisitions it the podcasting space yesterday because it’s really rare you see two acquisitions get announced at the same time and even as we were looking for precedent around a press release or how to announce as a public company you’ve done two acquisitions on the same day, we couldn’t find it back in the day. So, we did two that all kind of came together in October of 2012 and that was iGoDigital. That was a big move into predictive analytics and then Pardot and Pardot was a really big move for us to acknowledge that the B2B marketing space was something different and something additive and that turned out to be a wonderful acquisition for us as well. Dave Knox: And one that has continued this day because both of those were founders you still work with. Dave Knox: Which is pretty fun. Talking all kinds of different part of ExactTarget, you guys had an amazing product, but you also had, what’s arguably the best culture I’ve ever seen, and that was intentional. You guys went and said orange as a culture is something you’re going to build the company on. What led you to think about culture as a differentiator for a tech company? Scott Dorsey: Sure, so when we started we wrote down our core values right from the very beginning and core value one was basically the Golden Rule, treat people well and we had it in our mind that we were going to be competitive but we were going to be kind and we really wanted to build a team and a culture that treated people well and we would speak about treating people well not only your customer, but one another, and prospects and partners and even competitors. So, we had this idea of treating people well and those core values created something special and provided a framework. I always describe it as a framework for hiring and a framework for decision making. And as we became larger as an organization and I couldn't be involved in every decision, nor could the leadership team, the core values were kind of the guiding principles to help our team know when they could go quickly and what we cared about and what we valued. So that was our first big wave of thinking about culture was really through the lens of the core values. Interesting enough, prior to me getting into the world of technology, my first job right out of college was with an amazing company called Steel Case, and I started my career thinking about how physical space impacts productivity. Physical space can drive collaboration. Physical space can shape culture, so that was something I wanted to bring into ExactTarget as well. And then I’d say the final piece is really our friend Tim Copland. We hired Tim as chief marketing officer. He really brought the view point that marketing is not only marketing out, but it’s actually marketing in and we talk often about marketing from the inside and if you can build evangelists who love the company, love the people, love the brand, that’s the best marketing you could ever have. So, it really was Tim’s idea to brand the culture orange, because we were hearing over and over, they’d be like we love your team, everyone’s so positive and energetic and smart and hardworking. We could feel the vibe when you come into an ExactTarget building or work with an ExactTarget team, but we didn’t have a framework for it. We knew it was something special, but we didn’t have a great way to describe it. It really was Tim’s idea to take our brand color orange, turn it inside and create a culture called Be Orange and that became the cultural framework that drove the company and going back to our last topic around M&A, culture really helped us integrate companies and cultures into one, if you will. So, every office and geography had their own subculture, but we all stick together by this feeling of orange and it was really really special and our team in Australia would do a team building event and they’d all wear orange and they’d be so proud or maybe they’d run a marathon that had nothing to do with work and they’d be wearing orange and they’d send me photographs and the same thing in Brazil. We had a loose framework of how we spoke about culture, but beyond that it was more of a feeling. It was a sense you had that you were orange and were a part of something really special together and the last comment I’ll make here is one of my favorite stories is about maybe a year and half or two years after the Salesforce acquisition when really the ExactTarget brand really started to dissipate and for many good reasons Salesforce wanted the team to feel Salesforce and Salesforce Blue, one of our team members spun up a Facebook group called Orange Crush, and literally Dave, over one weekend over a thousand members joined and over 2500 pictures were posted and I thought, that’s pretty awesome. If that happens even after that company no longer exists, and you’ve got that kind of alumni network, you know you’ve done something pretty special on the culture side. Dave Knox: That’s wonderful. Let’s talk about that alumni network, because you left Salesforce 2014. You are not one to go sit on a golf course and hang out, so a year later you started High Alpha and started it with several of your fellow executives from the days of Exact Target. Tell us a little bit more about what is High Alpha, what is High Alpha Studio, what is High Alpha Capital, what are you guys doing? Scott Dorsey: I’d be happy to. Your question, I want to tell you a quick little story. My wife, Erin, we’ve been married for over 25 years. She’s phenomenal, she’s every reason for any little ounce of success I’ve had. When we wrapped up at ExactTarget and Salesforce, she said don’t forget I take great pride in having a hard working husband and that said it all. That said it all. I take great pride in having a hard working husband, so that’s all I needed to hear. That was code for don’t think you’re going to play golf and tennis five days a week. Dave Knox: That’s a lot, my daughter who’s six years old, now that I’ve left WPP and I’m doing my own, she goes, Daddy doesn’t get to go to work anymore and hang out with his friends. So explaining entrepreneurship to a young child is an interesting thing. Scott Dorsey: Right, but I love working hard. I like tackling difficult challenges and more than anything I love supporting entrepreneurs and love coaching and mentoring and I had an infinite number of people help me in so many ways along our journey that it’s such a privilege to be able to help others. So, High Alpha really started with the four founders, Mike Fitzgerald, Christian Anderson and Eric Tobias were friends. We knew we wanted to do something together. We had all worked together in one way or another and we complement each other beautifully and we started saying that we just love helping to found SAS companies and cloud companies and boy if we could do that, rather than nights and weekends as a hobby, if that became like our full time job, our full time motion, could we build a company that started companies? Could we build a platform that became really really good at starting new cloud companies, that would be something that we’d love to do? And through a little bit of serendipity, we ended up talking to investors and friends about what we were thinking about and we ended up having a number of term sheets come in and fortunately a lot of wonderful investors who wanted to support us and one of the investors was Emergence Capital and another was Greenspring and we’re actually out here at the Greenspring conference. What became evident was Greenspring was more aligned around helping us start a fund and Emergence was more aligned around helping us start an operating company. So we thought, let’s do both. Let’s but the best of all worlds together and the logic which has really proved itself is in markets like Indianapolis, it’s very difficult to raise capital. It’s very distracting for the entrepreneur to spend so much time raising capital and not enough time frankly building their team, building an amazing product and building those early customer relationships. So having the startup studio and the venture fund in tandem, created some real competitive advantage for us and in many ways creates and 18 or 24 month funding road path if you will, for the entrepreneur and helps them focus where they can make the biggest difference in starting their company. Dave Knox: So let’s talk a little bit about some of those people, one of the hearts of High Alpha has been the ExactTarget alumni network and these amazing people that helped you guys build what it is and now are joining the entrepreneurial side. Making that switch though from a big company like Salesforce, jumping into the world of a High Alpha startup. That’s tough, not everybody can do it. So when you’re looking at talent and you’ve got that person raising their hand or you’re looking to recruit somebody, how do you decide and your gut tell you they’re going to be able to switch? Scott Dorsey: That’s an amazing question. In High Alpha we have 35 team members, so I’d say small environment. Even smaller is go join a startup, right? Be cofounder, that’s really really small and very difficult. So it does take a different make up. I heard a wonderful term yesterday I loved was an entrepreneur in corporate clothing. And that’s really what we’re looking for. We’re looking for individuals who are entrepreneurial in how they think, how they act, how they can assert themselves and really make something happen from nothing. I think what’s most difficult in transitioning from a large company environment to small. When you’re a large company, you’re really playing triage all day, so many opportunities and communications are coming your way, you’re trying to sort and sift through them and pick areas of prioritization. When you’re in an early stage company, nothing is coming your way, zero. You’ve got to make it all happen and being able to search yourself, being able to see a little crack of an opportunity and know how to run through that door is a really different skill set, so it’s a great gift actually, Dave, that we’re able to work with so many former colleagues because we had shared success. We know what success looks like. In many ways we can kind of finish each other’s sentences. We have a common vocabulary. So it really does help you go faster, but it’s finding a special person that’s ready to go from big to small and make a bigger impact and maybe do it with less security and structure than they’ve had before. So, it’s somebody that’s very driven, knows how to take initiative and probably has done things throughout their life that are entrepreneurial. There’s got to be some kind of entrepreneur track record that they can leverage and pull from. Dave Knox: With that mode, we get a lot of people that come for advice, I want to do a startup or I want to entrepreneurial. Sometimes those people don’t necessarily have those skill sets that you just described, but their dead set, that’s what their heart wants to do. How do you mentor and coach somebody that maybe doesn’t have that complete skill set? Can they develop it or do you have to give them the hard truth? Scott Dorsey: I think you have to give them the hard truth and I think we have to be as candid as possible about how difficult start up life can be. It’s difficult and you have to be ready for it and your family’s got to be ready for it and you’ve got to know you’re heading into a situation where there’s more risks than you’ve probably had in the past. Now we like to think at High Alpha that we de-risk a startup because of our experience and our access to capital and all the good network that we’ve built over time, but there’s still risk and it can be lonely really getting started so, we try to be as candid and upfront as possible, and then one area I’ve been spending a lot more time working on and thinking about Dave, is the idea of cofounders. In many of our companies, we’ve started with one single co-founder and then maybe over time we’ll start hiring their leadership team and I think having two or three cofounders out of the gate can be really really valuable because then you have the support system built in. High Alpha is a support system, but we’re still different. We’re cofounders early and then investors late. There’s no substitute for people in the trenches with you where when something really good or really bad happens, like the first phone call you make, that’s got to be your friend and cofounder. So, some of those individuals that may not be as entrepreneurial as required to be the startup CEO still could play an important role I think on a founding team. Dave Knox: I love that, makes a ton of sense. Let’s talk that emergence of corporations and startups. This week you guys had a great event called Alloy that was out in San Francisco where the theme was around startup engagement and the premise of that is the going forward big companies need to place as much importance on engaging with startups as they’ve historically done on research and development or mergers and acquisitions. So what’s been your experience of the Fortune 500 and big companies overall understanding that and be willing to embrace it? Scott Dorsey: Thank you for speaking at our conference, by the way, Dave, you did a great job. Scott Dorsey: Especially in the sweet spot of what you’ve written about and what you speak about with Predicting the Turn. In our experience, we started with several idea sources. One was just our own ideas that are a problem we desperately want to solve in the world of B2B software. Second would be entrepreneurs approaching us with an idea. Third, our venture partners, maybe CFE, Mura, new market or new technology trend where we could start a company. And then the fourth, which really surprised me was large corporates coming to us wanting to start new companies or wanting help in shifting their culture to be more agile and more entrepreneurial. Now, not all companies can do that, but I’m definitely finding that big companies, they’re fearful of disruption. They know they have to keep reinventing themselves. Leaders, even a younger generation of leaders think about digital in a brand new way and are trying to infuse those principles into their business. So in some ways, we’re almost reluctant consultants that we’ve kind of gotten pulled into this world, but we’ve been happy to do because it's allowed us to learn a lot about different companies and industries and find new sources for ideas to start companies in brand new industries. We’ve seen the shift over time of companies focused heavy on R&D and some of those returns are starting to dissipate and the second going really to M&A that if you can’t innovate, just buy your way to innovation and I think that still plays a role. The third is this idea of start up engagement and not being afraid to start new companies and really not being afraid to start new companies outside the four walls of BigCo because as you know first hand, it’s so hard to innovate inside the four walls of big company. There’s so much structure and an aversion to risk, rightfully so in many cases, that you can’t do what you need to do as a startup, of taking risk and moving fast and raising capital from outside sources and breaking some of the rules. So, we’re starting to see a trend of big companies partnering with studios like High Alpha or other avenues to start new companies. And boy can they make a difference as maybe a first customer or an equity investor and also equally as powerful, big companies can learn a lot from startups and when big companies become a customer of an early stage company they can shape product road map. They can infuse that start up ethos into their company and they can completely change the trajectory of that early startup. It changes everything. It can make the company more fundable. It can make the company grow faster. It could create jobs. It can grow their local tech communities. So I encourage a lot of big company CIOs to create an environment where you can test and experiment technology being built by early stage companies. That can be quite powerful. The other element is if you want to create radical enterprise value for a BigCo, you should be looking at startups and you should be looking at startups that are disruptive and you look at, just as one example, what’s happened with Lineman Bird here over literally the last year or two. Those two companies are valued at well north of a billion dollars. They’re transportation companies. Why did the bicycle companies or the auto companies not start those firms or not get in the game? They just didn’t see the opportunity. Dave Knox: That’s exactly it. Probing that one a little bit more, some of our peers in the world of venture capital could not disagree more about big companies engaging with startups, more because they think the big company is going to send that startup on bad path. Some of the most famous on the West coast and the East coast have be very vocal about it. What’s your view on that? Are they just flat out wrong? Have they been swayed by bad experiences and we’re in a different time today? Scott Dorsey: That’s an awesome question and I think not all big companies are created equal. So, I think some big companies think that they want to be friendly to startups, but they don’t have the mindset. Or often, here’s what happens is maybe an individual at a senior level kind of thinks it’s a good idea, but it gets down into the team that’s got to implement it and you can’t break through the clutter, the organizational inertia to get something done. But, I’m seeing, I think it’s company specific. I’m seeing big companies that have the right frame of mind can be amazing partners for early stage companies, but I do agree, you can’t say that for all companies and there are plenty of big companies that can be too much of a time burden and far too difficult for the startup to work with and the startup entrepreneur has to be so careful not to spend time in the wrong places or not be chasing a big enterprise in a disproportionate way because they’ll likely just be disappointed and spend a lot of cycles that they could have better utilized in a different direction. Dave Knox: That’s the value of having someone like High Alpha as a partner because you can give that advice, play that buffer, help that entrepreneur realize maybe something is going a little off tract now. Scott Dorsey: We’re learning all the time too. So we’re getting better and better at pattern recognition and learning from our own mistakes. Dave Knox: So you mentioned there are the four areas that kind of inspired you, the things you create with studios and the spaces you invest. One of the things that comes out of those four areas is something called sprint week. Tell me more about that. Scott Dorsey: Yeah, I’d be happy to Dave and I think this has been one of our most impactful developments in the three or four years we’ve been doing this at High Alpha. At the highest level we created sprint week, we run four sprint weeks a year to, this is going to sound silly, force us to start a new business. So we realized you can just come up with a hundred reasons why not to start a new company, it’s so easy to throw, splash cold water on an idea. It's not a good idea. That’s already been tried. There’s too much competition. You’ll never get funded. So we had to create a mechanism that created a cadence for new company creation and that really lead to sprint week and it’s been magnificent. So we take our 4-6 best ideas. We run them once a quarter. So, throughout the quarter we are filtering. We’re bringing lots of ideas into the top of the funnel. We’re vetting them. We have business analysts that will do work in research. Ideally we start to create a pool of cofounders who might be well matched for the idea that we think has merit. And then we role into sprint week into 4-6 teams, typically each team is led by one of the High Alpha partners and it’s a mix of High Alpha team members, so all 35 team members participate in sprint week, regardless of your roles in the business. We’re all company creators. And then we bring a lot of outside guests in. That could be maybe a subject matter expert, maybe a potential cofounder, maybe a potential investor. We mix those teams together and we literally try to compress 3-4 months of worth of work into three days. So Monday tends to be a focus on the problem we’re solving. Are we clear on the problem that we’re trying to solve or the opportunity? Day two tends to be designing the product and the solution and then day three tends to be designing the business and the business model. At the end of those three days, we present to one another on day four, so it’s like an internal pitch competition or business plan competition and the decks that are built are remarkable. Like you can’t imagine they’ve been built in three days. So, we’ll develop the brand, the digital presence, and the constraint of time can be a wonderful thing actually. So, we might prefer to spend two months trying to come up with a company name, but we might only have an hour in sprint week. So, come up with five ideas, do some domain searching, pick one and go. That would be just one example. We do high fidelity product design. We build a resource plan. We build the financial plan. We do a competitive landscape analysis. And we do a whole lot of customer development. Ideally, we’re going to talk to 20, 30, 40 customers and get a real sense for what they might be interested in and hopefully line up 5-10 of them that want to be early Alpha customers. So, that whole methodology has served us really well and ideally we’re going to come out of sprint week with one or more ideas that we’re ready to hit the green light and go ahead and start those companies. Dave Knox: There you go. That’s awesome. And so final question I want to spend some time, because we’ve got a happy hour here for Greenspring to go to. Dave Knox: One of the concepts I’ve been playing around with is this idea of continuous beta. The idea that companies, but really the people at those companies, the world is moving so fast that no one can be comfortable with where they’ve been. They have to be continuously moving forward and evolving their skill set, their mind, their thinking. You’ve done that with your career going from Steel Case to being a founder of a tech company to becoming an investor and now really being a community change agent, in a lot of ways. How have you thought about that idea of continuous beta in your own life? Scott Dorsey: Yeah, I love that term by the way, continuous beta. I think that’s a state of mind that everyone should have. For me, it’s really interesting when we started ExactTarget, I knew nothing about starting and scaling software companies. I was a sponge. I was on the learning side of every interaction I had and even the venture firms that invested in us would hold quarterly conferences and I attended every one I could. There was like a benefit of knowing that there was just so much I didn’t know. So I really went into ExactTarget company building with a learning mindset and just became a sponge and never passed on a learning opportunity. Somewhere along the way, then you end up being the mentor. You end up being the panelist. You end up being the speaker. And I try to be really conscious about making sure that I’m still learning and you can mentor lots of people, but you still need to be mentored and the real blessing for me over the last 3-4 years of High Alpha has been around learning the world of venture capital. So I knew the world of venture capitalism as an entrepreneur, I really didn't know the world of venture capitalism as an investor. So that’s an example of an area where I seek out mentors, I have mentors. I’m asking for advice all the time. I’m attending conferences. I’m reading articles and listening to podcasts. I still have a long way to go, so I’m learning as much I can about the world of venture and just try to keep myself fresh and sharp and setting good example for others that you regardless of age and experience, you got to keep learning and stretching yourself and your point D, things are moving so quickly, you have to be careful you’re not operating out of an old play book and I worry about that. ExactTarget, we sold in 2013, it’s been more than five years, so I have to be careful to implementing new playbooks and not just relying on one that worked in a different era. So those are really important things. I’m not sure I’ve got it mastered, but I’m conscious of it and trying to work on learning and stretching myself in every way possible. Dave Knox: That’s wonderful and that’s such a powerful self actualization because I think a lot of successful entrepreneurs, they forget that lesson, that the world is moving so fast that what worked in 2000 and 2005 and 2013 might not work anymore. Dave Knox: That’s wonderful. Well, thank you so much, time is the most valuable commodity, so you taking an hour to do this, really means a lot. Scott Dorsey: It was my pleasure. Dave Knox: Thank you for being such a mentor and an inspiration to the Midwest and everything else. Scott Dorsey: Well, right back at you Dave, I appreciate everything you’re doing in Cincinnati and the more we can work together and lift up communities like Indy and Cinci, I think we’re all going to be better for it. So this was an absolute treat. Thank you.